Larry Gearing was riding his bicycle up a hill toward his home in 2006 when he felt chest pains. A doctor’s test revealed that, six months prior, he most likely had a silent heart attack causing a blocked artery. After undergoing cardiac rehabilitation, Larry and his wife, Charlene, decided to get fit and healthy. Using the online fitness program, “Training Peaks,” the Gearings worked with virtual coaches to create weekly exercise and diet plans. Their dedication soon paid off. Larry ran his first 5K race and 100-mile bike ride. Charlene shed 30 pounds and completed a 5K race. 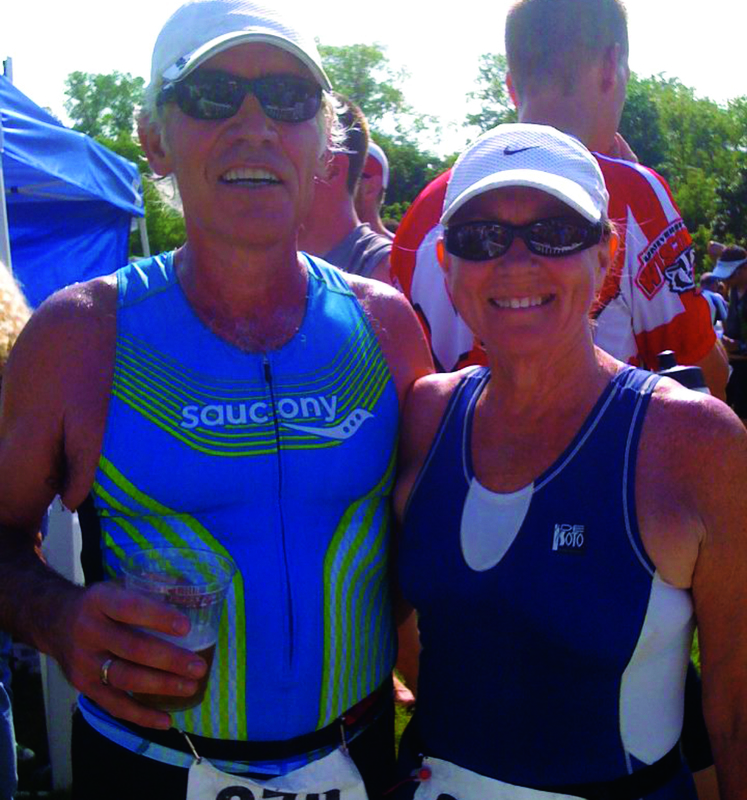 At first, Larry joined Charlene at triathlons — but only from the sidelines. “He was my sherpa,” she jokes. Inspired by his wife’s grit, Larry began training with her. “I felt guilty driving around in a car that had event stickers on it, for [sporting] events I hadn’t participated in,” he recalls. Since then, the Ko Olina couple has trained for dozens of races and events. Charlene completed her first triathlon in 2009 at age 57, represented Team USA in the 2014 International Triathlon World Championship in Canada, and finished a Half Ironman in 2016, among her many outstanding accomplishments. Larry completed his first triathlon in 2012, at age 62. That, plus the 8-mile Great Aloha Run, 60-mile bike rides, two Hapalua Half-Marathons and the 10K XTERRA. They’ve hit roadblocks along the way. Charlene’s first 5K run ended in a pulled hamstring muscle, plantar fasciitis and physical therapy. The swim portion of Larry’s second triathlon in 2013 sent him to the emergency room with a flash pulmonary edema and bypass surgery. His heart is stronger now, thanks to an implanted defibrillator in his chest. “All of these things have not stopped Larry from being a good runner,” Charlene says with pride. Fill your daily diet with whole grains and colorful fruits and vegetables; avoid processed foods. and nutrition goals. Track your progress on a smartwatch, mobile device or computer. Combine weekly exercises with weight training, flexibility and balance, and cardio-endurance, such as running, swimming, walking or biking. Inspire others to be healthy and active; set fitness goals, and surround yourself with supportive, positive people. Awesome couple! They do live the healthy lifestyle by example. I see life after 60 can be fabulous. Wow you two make it look easy. Cheers to Charlene and Larry! Team Gearing!